Yale president Peter Salovey takes a stand for free speech. Last May in this space, we wrote about Frederick M. Lawrence, the spineless, mendacious, and politically correct president of Brandeis University, and his decision to rescind an invitation to the Somali-born American activist Ayaan Hirsi Ali to receive an honorary degree and address the graduating class. Lawrence cravenly bowed to pressure from the university’s Muslim student organization, abetted by some sympathetic faculty (shameful fact: 85 of 350 signed a petition describing Hirsi Ali as “a notorious Islamophobe” and demanding the invitation be withdrawn). That malevolent farce was orchestrated behind the scenes by CAIR, the Council on American Islamic Relations. As we noted, some innocent people assume that CAIR is the Muslim equivalent of the Knights of Columbus, B’nai B’rith, or the Benevolent and Protective Order of Elks. In fact, as Andrew C. McCarthy noted in The Grand Jihad: How Islam and the Left Sabotage America, CAIR was and is an Islamic supremacist organization masquerading as a civil rights group. Formed in 1994 in order to promote Hamas, the Palestinian terrorist organization, its modus operandi is intimidation; its goals include stamping out criticism of Islam and, ultimately, instituting Sharia—Islamic law—in the United States. An offshoot of the Muslim Brotherhood, CAIR was an unindicted co-conspirator in the 2007–08 terror-financing prosecution known as the Holy Land Foundation case. President Lawrence was terrified of being publicly identified as an “Islamophobe,” an epithet whose cognitive content approximates zero but whose potency as an instrument of intimidation cannot be doubted. What happened in Rotherham, England, where mostly Pakistani Muslims systematically abused at least 1,400 helpless white girls while the authorities, terrified of being outed as “racist” or “anti-Islamic,” turned a blind eye to the abuse, shows that the dynamic of intimidation is not only an academic phenomenon. At Brandeis, free speech and open discussion were traduced because those entrusted with protecting these prime academic virtues were too cowardly to stand up to intimidation. In Rotherham, more than a thousand young girls were raped and pimped out because local authorities—police, social workers, and even, in some cases, parents—were afraid to challenge the pseudo-multicultural gospel of radical Islam. Nice words, but university presidents are not speaking under oath when they deliver pep talks to nervous freshman. Doubtless Frederick Lawrence has at some point said publicly that he, too, believes in free speech. Aristotle wisely observed that morality inheres not in your opinion about the good but in actually behaving morally. So it is with free speech. One’s abstract opinion in favor of it counts for nothing. What matters is one’s willingness to defend it when challenged. Peter Salovey didn’t have long to wait. Early in September, the William F. Buckley Jr. Program at Yale, an independent organization founded in 2011 by the (then) Yale senior Lauren Noble to perpetuate the intellectual legacy of its namesake and to foster intellectual diversity, invited Ayaan Hirsi Ali to give a talk under its auspices at one of Yale’s largest lecture halls. The announced title was “Clash of Civilizations: Islam and the West.” Like clockwork, Yale’s Muslim Student Association wheeled into action. They asked for a meeting with Rich Lizardo, the Program’s student president, and demanded that he disinvite Hirsi Ali, that she not talk about Islam, or that the program include another speaker to offer “an alternative perspective.” The prospect of protests and the involvement of the Yale administration and CAIR hovered in the air. 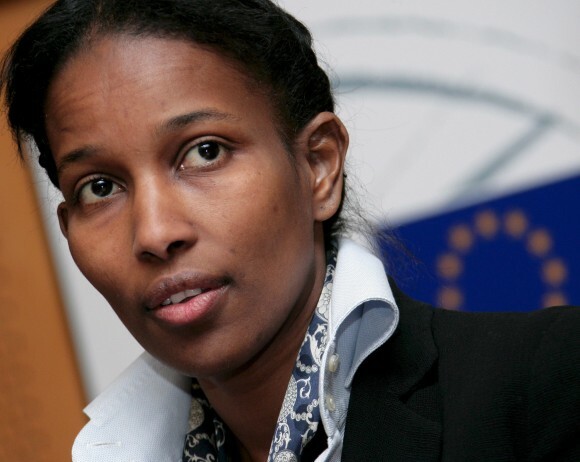 When Lizardo made it clear that the Buckley Program had no intention of acceding to the MSA’s demands, the organization circulated an open letter, putatively endorsed by some thirty student groups—including the Women’s Center, the Yale Atheists, Humanists, and Agnostics, and the Yale Friends of Israel—expressing hurt and outrage at the invitation of Hirsi Ali. (As it turned out, several of the groups listed had not signed on to the letter.) The letter claimed that her attacks on Islam “have been classified as hate speech and have been considered unprotected libel and slander.” (By whom, exactly?) In one passage of unintended humor, the letter also claimed that Hirsi Ali “does not hold the credentials” to speak about Islam. This contention, we’ve noted, is often trotted out as an objection to Hirsi Ali. It is, as anyone who has looked into her biography and work well knows, laughably absurd. Her experience of Islam began when, as a young girl, she suffered genital mutilation at the hands of a relative (an act that the MSA letter referred to as an “unfortunate circumstance”), continued with pious religious education, and then fundamentalistic indoctrination. She later fled an arranged marriage and was subjected to death threats in the Netherlands for her work with the filmmaker Theo van Gogh on Submission, a film highly critical of Islam. Van Gogh wasn’t that lucky: The threats crystallized when he was brutally murdered in the street by a Muslim fanatic—shot eight times in the chest, throat slit with a butcher knife, almost severing his head. A five-page screed, threatening Hirsi Ali with a similar fate, was skewered to his body with a smaller knife. No, when it comes to the nature of Islam, Ayaan Hirsi Ali has the credentials that matter: an early life filled with doctrine and plenty of later first-hand experience. Much though we appreciated Professor Goldblatt’s mollifying influence—his performance was like the felt on piano hammers—we cannot help pointing out that “monolithic” is a dubious term. Nothing, if you look closely enough, is “monolithic,” not the Japanese or the Germans in World War II, not Soviet Communism in the Cold War, and not Islam today. But to say that something is not “monolithic” is not to deny that it exhibits characteristic behavior. Hirsi Ali, whose presentation was a model of articulate serenity, made a similar point when she observed that, pace Professor Goldblatt, there was only one Islam even though there were several sorts of Muslim followers. The “core idea” of Islam, she pointed out, is submission. That is what the term “Islam” means: submission, specifically submission to the will of Allah. For more than thirty years, Hirsi Ali noted, the West has been “exercising restraint” in dealing with the metastasis of that demand for submission. True, we have gone after certain “brand names”: Osama bin Laden and al Qaeda, for example. And we seem to be gearing up to go after the new brand name called “Islamic State.” But we have failed to challenge the underlying reality, the core idea, that makes Islam a threat. In Matthew 22:37, Jesus enjoins us to love God with our whole heart, whole mind, and whole soul. It is, he says, the greatest and foremost commandment. In the modern world, Jesus’s injunction is not an exclusionary imperative: If you don’t sign on to the Christian program, you need not fear for your life. We must also render unto Caesar that which is Caesar’s. There is an intrinsic legitimacy to the secular realm that Islam lacks. To be sure, there was a time when Christians gleefully slaughtered each other over doctrinal differences. The Thirty Years War, which pitted Catholics against Protestants, left as many as 11 million dead. But that was then. As Hirsi Ali suggested, there is a powerful aroma of unreality wafting about the official response to Islamic atrocities. It’s an example of what philosophers call the “No-True-Scotsman” fallacy writ large. Say, Angus MacAllistair goes on a rampage and kills dozens. “No true Scotsman” would act in such a way. Do we then conclude that Angus was not really, not truly a Scotsman? And why do not “moderate Muslims” concentrate their criticism on such atrocities instead of attacking reformers like Hirsi Ali? In modern secular societies, people are free to caricature the Bible, make fun of Jesus, and guy Jews. We may not like such things. But we do not regard such behavior as (to quote Nabokov) an invitation to a beheading. Hirsi Ali is right: Military action, though necessary, will not by itself address the problem of Islam. That can be addressed, she concluded, only when Muslims as well as the rest of us have the courage to “stand up to Allah” instead of submitting to him.